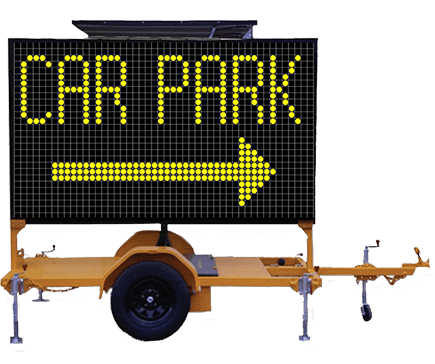 Hire Gold Coast and Brisbane VMS signs for all of your traffic control and outdoor advertising needs. We also operate in Ipswich, the Sunshine Coast, Byron Bay and Northern New South Wales. Our trailer mounted VMS boards are simple and easy to transport and are available in both amber and five colour options. The variable message signs are also solar powered, so there are no ongoing running costs, which make these a cost-effective solution for traffic management and advertising. ETC Hire’s Gold Coast and Brisbane VMS signs are popular for sales promotion, news updates, opening hours, event times, directing traffic and many other applications. Even better, with variable message signs you can target specific locations and peak traffic times to reach the largest audience. For traffic control and management, these signs play a vital role in warning road users and pedestrians about traffic events to avoid hazards, as well as ensure road contractors are safe during road works. Both our amber and colour VMS boards are made with high quality LED lights which are designed to work efficiently around the clock. Our VMS boards are tested and serviced regularly, to avoid breakdowns onsite. Our VMS signs are Australian-made, so your are assured of quality and reliability. Contact us today on 1300 382 447 to arrange to hire Brisbane and Gold Coast VMS signs.